A couple of years ago, Clayton Lane gave a presentation at an event in Denver in which he told the story of Zeynep and Ziynet who live on the Asian side of Istanbul. Their daily bus commute across the Bosphorus River averaged five and a half hours each way, seven on bad days. 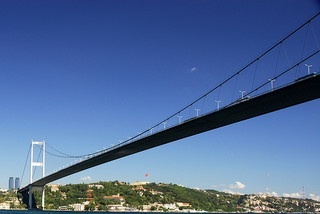 The government recognized that traffic across the Bosphorus River had become truly unbearable for far too many people. They made a decision to change that, summoned the political will and in less than eighteen months after their commitment, an 11 kilometer extension to their bus rapid transit system was built across the river. The entire system itself was only a concept as recently as 2004. After the extension, Zeynep and Ziynet’s commute dropped to less than an hour. Which raises the question: Why must it take so long to get anything done here? Watch a four minute video about Istanbul’s Metrobus system.